Below are examples of comments and feedback I received from readers who bought Destination Kimberley. All comments are unsolicited, spontaneous messages from readers that I received via email or that were posted somewhere on my site or on the web. You can find reader feedback about my other two Destination guides (Top End and Red Centre) at the bottom of the page. 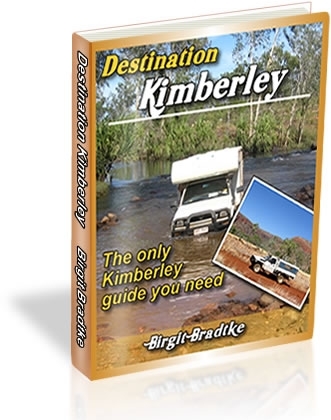 Many of the Destination Kimberley testimonials also refer to both the Kimberley and Top End guide which are usually bought together. These days, most people actually purchase all three guides. But the Kimberley is what sticks in people's memory and what they write about. The Northern Territory just does not compare. My wife, I and our 3 kids (aged 6, 9 and 11) did a 10 week journey from Melbourne up through Uluru to Kakadu, and then across to Broome on the Gibb River Road last July to October, and your books were one of the highlights of our trip. We used your Red Centre and then Top End books, and then as we passed into WA we had a ceremonial move to your Kimberley book. Every day as we moved along our journey we would open up to the next page in your book and the whole family would listen as we read your words about our next destination, and then it felt like something was missing when we headed South from Broome through the Pilbara and West Coast and we didn't have you with us (perhaps another book in the making for you??). Anyway, thanks so much, you really made our holiday and we quickly came to rely on your guides to help us source the best things we could do along the way. Thanks again Birgit, hopefully we can do the whole trip again with your guides in the coming years, we loved it. "We purchased "Destination Kimberly" at the beginning of 2018 and did the Gibb River Road in June. This book is excellent. It dispels many 4WD myths and the common sense approach is to be applauded. We spent 14 days on the Gibb Rd and Cape Leveque Rd and went to as many of the attractions along the way as time permitted. We stored our small van in Derby and then camped all the way in a good quality touring tent, gas stove, and good quality esky, etc. Now for the "tyres" and easy part. We did this trip from Canberra across the Nullabor, up the west coast of WA, through the Kimberly, across the Top End, through central QLD, then down the east coast to home. We did this in a 2014 Triton Dual cab diesel ute. A total distance of 17580 kilometers and not one single tyre mishap or puncture. We treated the Gibb River Road with respect and common sense. Along the way we did come across people who had punctured their tyres. So at the end of the day we just had a basic Mitsubishi Dual cab, with Highway tyres and we stuck to the common sense approach as outlined in the "Destination Kimberley" book. Thank you to the author of this publication, and we are going to do this trip again along the Tanami Road as a short cut in June, July, of this year." Your Guide is still the most comprehensive and best advice for independent travellers to the Kimberley and I hope it continues! We recommend it to everyone … and it is still compulsory reading for our new tour pilots every year. In May/June this year we spent 5 weeks traveling across the Kimberley and we used both your newsletter information and the downloaded Destination Kimberley extensively in planning and during our trip. Your advice on roads and conditions, websites, and campsite information was extremely helpful. It meant that we felt well prepared and being the second time across the Kimberley we were able to have some different experiences. Standouts were the Mornington Conservation Park and the gorges, on the river at El Questro (and happy hour) and a number of the Station stay campsites. All up, an amazing trip across such beautiful country. So, thank you for access to your experience and knowledge. It made a positive impact on our trip. "Your guides were fantastic on our trip. Extremely detailed and up to date information on the condition of the vehicle track as well as the walking tracks. My husband and I relied on your guides throughout our trip. I had injured my hip and hamstrings in a fall at Kalumburu and my husband has a wonky knee so some of the tracks were just too difficult for us and it was great to get a walking track report before we committed to the walk. I downloaded onto my iPad as Wi-Fi is spotty at best up there. We would have missed many amazing places if it hadn’t been for these guides. Thanks again for your wonderful guides. We told lots of other people we met around the camps about them." This September my wife & I (at last!) got the opportunity to do a proper trip - hired a 4WD camper in Broome, scooted up the highway to Lake Argyle, and then slowly wended our way back along the Gibb RR. Beforehand we (obviously!) downloaded your Guide - and wow, what a feast of information - it really is a triumph of easy-to-read, worthwhile information, and one even gets a chuckle too at the tongue-in-cheek comments that bring it all to life. Congratulations! Anyway, just to say that we thoroughly enjoyed our time in the Kimberley, even though we could only spare a week off work - and at the risk of repetition - it would have been infinitely less enjoyable without your Destination Kimberley guide. We had read bits beforehand but I was surprised at how much we used it while travelling - one would drive, the other would read about the places up ahead - and we even changed our sleep-over plans once we discovered essential on-the-ground details (which we could only understand when we were actually there). We also had a great time at Mt Elizabeth Station - we took an afternoon-evening stroll and the bird-life was just amazing - also woke in the early hours of the morning to a symphony of birdcalls - quite magical. And when the Eftpos line couldn't get through, Emma simply said "have it on the house...". We'd love to visit the Kimberley again but that would just have to be longer than a week..."
"I just wanted to congratulate you on your fantastic book! I travelled through the Kimberley about 25 years ago and I am now planning a return visit with my husband and children next year. I purchased your book and can’t believe how detailed and extensive it is! You have done an amazing job. I have heard it is very busy up there now, which to be honest I’m a little disappointed about as the isolation and remoteness was part of the charm from my first trip. In saying that I am still super excited to travel back there and show my family. Thanks again, you will make our trip all that more memorable." Close window to return to the previous page. "Want to say that I love, love, love your guide to the Kimberley. We have just spent 12 weeks camping which included the Gibb River Road. We spent 28 days on the Gibb and travelled 3,362 kilometres! What a trip - your guide was so useful, and we carried pages with us on some walks. Great work and thank you." We spent a month (June/July) this year in the Kimberley with the main focus being the Gibb River Road. We found your book invaluable. It had all the tips that one gets from other travelers (often after you've moved on) that get the most out of each location. I read the history sections out loud to my partner and son as we drove from one location to the other and they added to our experience. We were blown away by the beauty of the area and I have some great memories and great photos. Thank you again. Julie, Shane and George"
"1000 Dank für deinen tollen Guide. Wir werden AUG/SEP nach 10 Jahren zum ersten mal wieder in unsere "alte Heimat" reisen und mit unseren 4 (fast) erwachsenen Kindern u.a. per Wohnmobil von DRW-ASP fahren. Wir freuen uns alle total auf den Urlaub, werden es entspannt angehen und dein Guide wird die ganze Zeit dabei sein! Nochmals Danke – es ist vllt etwas hochgestochen: Aber mit dem Teilen von deinen Erfahrungen setzt du wirklich ein Zeichen gegen Konsum, Kommerz, Egoismus… Das finde ich gerade heute sehr wichtig! "Thank you for all the information we got from you, which was invaluable for our journeys. So proud we made Kununurra to Broome, via Mitchell Plateau and most of the other sights, and then up to Cape Leveque, without a single puncture or other car problem. My husband drove exactly as per your advice, and it worked. Saw plenty of others with problems though. Please keep up your excellent work for others. There is nothing else like this, and we recommend you to anybody we meet planning a similar trip!" 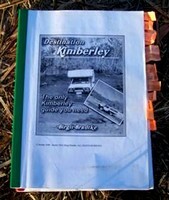 "I purchased your Destination Kimberley Guide in 2010 for a trip we did in 2011, we found your guide invaluable. We found ourselves in places we would not have considered (Whale Song camp where we spent 11 days just to name one) and travelling roads recommended by you that proved to be absolutely brilliant (Duncan Road & Buntine Hwy). This year we will return to the Kimberley and once again use your guide. As our version is out of date I was wondering if I can get an update or do I need to purchase the latest copy? I also wish to put the guide onto my iPad if this is permissible. Thank you again Birgit for providing Destination Kimberley, you do a brilliant job." Note: Of course it is possible to get an update! No need to ever purchase one of my guides again. You buy it once and you will always have access to the most up to date version of it. And of course you can put it on your iPad if you wish! "Briefly, I want to thank you for the unique service you offer: our latest trip to Australia (our eleventh) took us to The Kimberley for the first time. Your guide outshone all the others and gave us a great holiday with your unapologetic opinions and sound advice. Thank you SO much!" "Our trip to the Kimberley saw us leave Brisbane on May 5th and return June 20th - 47 days, 12,400 kilometres. We started with a party of five in two Land Cruisers. My wife flew into Darwin & bused to Katherine to join us. Then it was to Kununurra, Wyndham and onto the GRR. We stopped, camped, hiked, swam at El Questro, Ellenbrae, Manning Gorge, Mornington - sadly Tunnel Creek area was still inaccessible. So out to Derby, Broome, Cape Leveque, Fitzroy Crossing & Geiki Gorge, Purnululu, Lake Argyle and on to Darwin before two Canadians flew home while the four of us headed south to Daly Waters, Three Ways, Barkly Homestead, Mt. Isa, Longreach, Mitchell & home. We had a fabulous time thanks to your excellent advice. Could not see everything (a reality) but completed the trip without damage to the vehicles tires or otherwise, though the trailer got shaken up a bit. Only stopped for 'coffee' at Home Valley Station but would opt for it versus El Questro another time. Lots of interesting bits like the Rusty Shed Cafe in Wyndham. The 2nd couple from Canada asked if they could come when they heard I was going to be returning to Australia. I loaned my material to them and Richard's wife Kayla read your advice aloud as he drove in the mornings! Richard who had travelled to Australia in the early 60's kept telling me that our trip north & west was better than he had ever imagined! We had a terrific time and though we saw the results of foolish driving - one rental LC with rear axle broken at the differential housing on a recovery vehicle headed to Kununurra - and punctured/torn tyres, we suffered no failures." "Just a quick note to say thankyou. We went from Darwin to Kununurra, down to Purnululu and then across the Gibb to Broome and up Cape Leveque. Your ebook is brilliant. Your information was absolutely invaluable. Aside from the occasional minor entry fee increase since the last edit it was absolutely spot on. Your descriptions were exactly correct and very, very useful. Very detailed and very well written. You should be very proud of what you've created. It is an absolutely brilliant product you have put together and I recommend it to anyone thinking of heading to that part of the world." "I just want to say thanks for all the work you've invested into the Destination Kimberely eBook. It was a great help during our time in Broome, Dampier Peninsula, the Gibb and Purnululu. I enjoyed the honesty of the experiences you shared in addition to all the details you covered. We had a wonderful time in the Kimberleys and were able to get to almost everything. Thanks again for all the information you put together. It was invaluable." "Hello, we travelled the Kimberley two years ago using your guide - best holiday ever! Can't thank you enough for introducing us to your part of the world. Last year we went to east Arnhem Land after reading your review of the area in the Top End guide. Just fantastic! This year we are headed to the Pilbara and wondered if you have written anything or can recommend someone else's blog for the region? Thanks again for your guides, they were invaluable. You took us on trips which will stay forever etched in our memories as among the best of a lifetime." Note: Sadly there is no Destination Guide for the Pilbara or west coast yet, though I'd love to offer one. If you know someone who knows that region like the back of their hand and would love to write a book about it, send them my way! "Just to say a big thanks for writing such comprehensive guides - just returned from a trip to the Kimberley and found your guides invaluable, particularly the tips on avoiding the crowds." "We recently completed the Kimberley trip we had been planning for 12 months and I wanted to commend you on your fabulous book that I purchased downloaded and bound and we looked and studied it often before travelling for 6 weeks from Darwin June 9 - Darwin July 20. All the valuable information was so informative and so very true to the word! We really enjoyed all stops and walks and gorges. We decided to fly into Mitchell Falls from Broome and walk from the campsite BUT had a great helicopter ride out back to camp. We also did the overnight Horizontal Falls sea plane from Derby and from Kununurra we had a flight over the Bungle Bungle ranges. We balanced the trip with these added extra treats as we had walked and driven and bounced about so much for the 43 days. I wanted to let you know that WE (2 x 50+ yr old couples with our 2 vehicles) really thought your book was so informative for us we followed the pages daily so we didn't miss out on our planned itinerary we made from your recommendations. A great fun and beautiful country up there. "We just got back from 2 weeks in the Kimberley – driving from Broome to Kununurra via the Hwy, and back to Broome via the GRR. We had a brilliant time, absolutely superb... using your guide extensively along the way. At your suggestion, we asked at Doon Doon Roadhouse about visiting Harry’s Hole, and the proprietor was great, with clear directions. He even let us use his phone to call Harry for permission. I have to say thankyou for putting this guide together – your plain English, no nonsense style is refreshing, and we were the best informed travellers we met. :) Your descriptions of the roads, the conditions, the services, the supplies, and your little tips along the way, were invaluable. We wanted to do so much more, and could have spent a month (or more) doing it more thoroughly, but our 2 weeks were rich and exhilarating. Congratulations on putting together a fabulous product – you really deliver... and it is apparent that you love the Kimberley – we can see why. "I just wanted to thank you for your fabulous Kimberley guide. My partner and I used it to take her mother on a two week trip finishing 23 May 2016 (Broome, Fitzroy Crossing, Purnululu, Wyndham, Kununurra then onto Darwin for the flight home) and found your information invaluable. My mother-in-law's father surveyed the Wyndham Darwin road in the 50's so this was in lieu of an 80th birthday party for her. To then receive updates from you at no further cost is amazing - we'd actually be happy to pay a subscription to receive the update. Anyway, thank you for your insights and the two of us will be back next year to more fully explore some of the gems we saw along the way." Due to all this unexpected rainfall, we had more time in Broome and drove up to Cape Leveque which was stunningly beautiful - white beaches and no people. And the sunny weather was just back in time. I want to mention that the Victoria River Roadhouse was absolutely worth a stop. And you also mentioned some hikes around there, we did and we really liked it a lot! Thanks for that!!! So, that was it. Both guides are just great and were very helpful! We definitely have to return to GRR to visit all the gorges. We really enjoyed our trip and made the best out of it. :)"
"We have completed our Gibb trip and would like to thank you for all the information that you provided. We were lucky in that the road opened up just as we were preparing in Kununurra, and the only things we missed were the gorges in the west, still closed as we passed. We had a wonderful trip and thanks to you we were fully prepared. We were staying in cattle stations along the way, all very good, but the star was Mount Elizabeth, the only one that is still home to the cattle farmers. I know that some people find it a bit spartan, but we were charmed by the proprietor, Pat Lacey, and learned so much about life in the outback. It is so sad that the station may soon be sold. The previous night we stayed in Ellenbrae, where the facilities are run by Logan and Larissa, two lovely people who made us very welcome and provided a delicious meal. But without your guide we might have missed all this! Thank you so much - and I hope that you keep the guide alive for future visitors to the Gibb." "Thank you so much for organising to keep your website and books updated. We were sorry to hear of your health issues. We purchased Destination Kimberley and Destination Top End a few years ago. Both of your guides were vital to the organisation and enjoyment of our 7 weeks spent touring the Kimberley from mid May to early July in 2013. We were able to see everything we wanted to see in that time. This included 23 days on the Gibb River Road with detours to Mitchell Plateau and Kalumburu. Most of the travellers we met were using your guide. We have recommended your guides to a number of our friends. 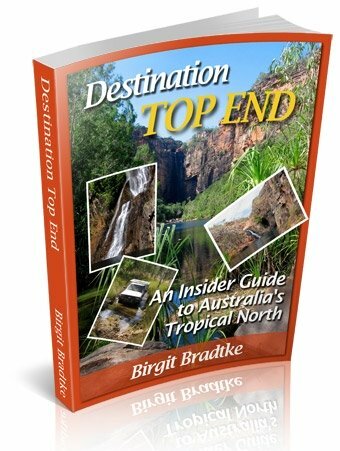 Next year we will be using your Destination Top End guide as we are looking forward to spending a couple of months travelling from Katherine to Darwin and the Gulf exploring everything we can on the way." "Many thanks for your terrific guidebook. My wife and I plus 5 other couples completed a trip along the GRR in July this year. It was fantastic and your guide book was very helpful even though this was my sixth trip. I just love the Kimberley and hopefully will get back again to see places we missed on this trip eg Charnley River and Mitchell Plateau." "My husband, got a copy of your book before we drove up to the Kimberley. We spent three amazing weeks up there. The trip was infinitely better because we had all the information you had written down!! Seriously, it made a huge difference. We have lived in WA for a total of 5 years (two times) and have camped extensively during that time. We waited until we felt extremely comfortable camping until we tackled the GRR. It was easier than we thought - even with three flat tyres! We loved every minute! Thanks for helping make it so great!!" "I have this concept in my head. It isn't profound in that I am not profound. But it seems important to me. Some people in this existence, shine, they are vibrant, they walk their own path, they achieve amazing things. They stand out, they have an energy about them. I think that these people are "Lights." The rest of those in existence are attracted to these aforementioned "Lights" whether it is just watching from a distance or flocking to the Light. These people are Moths. Moths vary in degree as well. You B, are a light. I am glad you enjoy your life. Though I don't know you, I feel you deserve it. Take Care and good luck with the moths." "Many of my friends who have visited the Kimberly recently used your guide and commented on how accurate it was. They always referred to it as they travelled along. We are going for 3 weeks this June so it will be our constant companion also. Thank you for keeping info up to date." "To buy your book was the best idea I had planning my vacation in WA!!! Many thanks for your help. I honestly did not think that getting your book will help so much and that you personally invest so much time!!! Many thanks!" "We have just purchased your Destination Kimberley Guide 2011/12. What a great read! This is actually the second version we have looked at as friends of ours had an older one from their trip. We used that to make our rough plans with them, and now with this new version we will get into the finer details. Your material makes planning everything so much easier and stress free. We can’t say enough how grateful we are for your work! Once again, thanks heaps for your work." "We had a wonderful time driving Darwin to Kakadu to the Bungles to Cape Leveque to Broome (via Fitzroy Crossing, not the Gibb). We used your guide and also your "Destination Top End" almost exclusively. You gave us (two 60+ couples) the confidence about the 4WD portions, especially the road into the Bungles. Thanks for all the advice and the honest assessment of various places. Your books were worth every penny and I'd encourage others to buy them! Thank you!" "I bought your two guides in Sept 2012 and we've done Broome-Darwin in Appollo 4 WD campervan. We were with our two girls (12 and 14). We did no plan anything : we read your guide every day for the next stop, avoiding "tourist mass" like you. Thanks for the lovely spot ideas. Thanks again for your guide (funny and lively to read). of course we could not do everything but we enjoy." "Just completed 12 nights on the GRR and Mitchell Falls road using your guide to find the gems, your descriptions were always on the ball and accurate. We loved the gorges and the swimming holes. Thanks for your books, they were invaluable and we have passed your details on to many fellow travellers. We will be in Broome for the next 10 days and the working our way round the paddock to be home on Gold Coast in October sometime. We would love to see the Kimberleys in the wet and when we win lotto will fly back." "I wish to thank you for this excellent guide. We came to the Kimberleys late October (2 families, so 2 rental 4WD, I was the only guy in our group of 7, big responsibility, ah ah ah). Anyhow, we had a great trip on the Gibb River Road. We didn't go till the Bungle that had burnt, so your guide gave us plenty of ideas for backup plans, like Fitzroy Crossing/Geikie Gorge. The guide is great at making you feel safe and comfy; it's just frustrating that there are soooo many things to see, the choice is so cruel. Ah, we'll have to come back! Thanks again, I highly recommend the guide to all my friends who think about this trip." "Brilliant books!! We are so looking forward to the Gibb River Road and I know your book is a good book to follow. Thank you for your valuable information. I love your honesty on how you see things, the good and not so good of some places. I want to follow your book once again to get the best out of our next trip. Your list of phone numbers and websites throughout your book has been so useful. Many thanks and keep up your good work!" "My girlfriend and I have just returned from a month's trip travelling through the Kimberleys, namely the Gibb River Road and numerous destinations that run off it. It was our first big camping trip and a lot of careful planning preceded it. The end result was well worth the effort. The planning was made so much easier by your Travel Guide purchased from this site as it was our tool for research. It was by far the most detailed and honest book we had available to us. Other guides were used (for maps, facilities available, etc) but your Travel Guide was the "bible" we referred to most in finding what was the most fun and exciting things to do on our travels. Your opinion was not biased in any way and gave a true depiction of what lay ahead. You obviously love the Kimberley and your enthusiasm for the region really shines through in your writing. If I was to be critical of one thing it would be your guide's lack of an index. Not a huge deal but it was a little frustrating at times to find certain things we were looking for. Then again, we spent a lot of time driving and relaxing at various sites so it wasn't like we didn't have the time to search through the books! 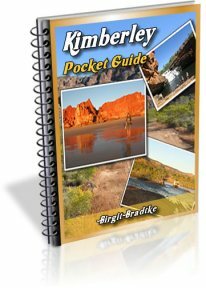 Again, thank you so much for providing such a thorough and detailed guide of the Kimberley. The book was fantastic and a huge help. It was our first trip to the region but I can promise you it won't be our last. Keep up the great writing." "Last year my wife, my two daughters 9 & 10 and I spent almost 3 weeks in the Kimberley starting and finishing in Broome. 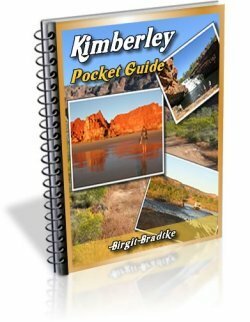 We used your Destination Kimberley guide extensively and found it to be far and away the best travel guide I have ever used (and I have travelled around the world using other more popular guides). So thank you so much for your efforts in preparing this guide." "It's now been 6 month that we're back from our marvellous travel in Australia. We spent a whole month there, driving a 4WD from Perth to Darwin, passing the Gibb River Road and Kakadu. As it is pretty expensive to come from France in the northern summer, and as we are not really young anymore, nor especially wealthy, there are few chances that we'll ever be able to come back. So I wanted to thank you very much because your counselling thru your website and books allowed us to make this travel a fantastic once-in-a-lifetime experience. Without your advice, I would never have dared hiring a 4WD, and driving more than 1500 km on dirt tracks, passing water holes, sometimes inhabited by crocodiles! It was really fantastic, and moreover, we now know we can do it! Thank you Birgit, please go on!!" "On 23rd of August we left Holland for Australia. We landed in Darwin and on Oct. 3rd we ended our trip in Perth. During these six weeks we had a marvellous time and we enjoyed it VERY MUCH! We drove the Gibb River Road and we were VERY GLAD we had read your two books. While driving they were between me and my wife. THEY WERE VERY HELPFUL!! Thanks a lot for your highly appreciated help!" "Ich wollte dir schon seit einer Weile schreiben, und mich bedanken, fuer das klasse Guidebook, was uns ueber 6 Wochen durch die Kimberleys gefuehrt hat (September/ Oktober dieses Jahr) We just didn’t want to head south of Broome to be without your guide! If you ever think of expanding even further, there is definitely a market for you to write about the Pilbara. And you would get all of us enthusiasts coming down from the Kimberleys, buying the next guide…but I guess you have just done that heading east to the NT. I am German, my husband is Australian, we are from Canberra but have taken 6 months off to travel mainly Western Australia with our kids (5 and 7 years old). We all speak German at home. But I can type much faster in English! Loved our trip so far, just loved it. Dicken Dank, ganz liebe Gruesse, und ich find das total klasse was du machst!" "Ich wollte mich nur kurz bei dir für deinen genialen Guide bedanken. Dank deines Reiseführers hatten wir einen unglaublich schönen und unvergesslichen 4-wöchigen Aufenthalt im NT und den Kimberleys. Dein Führer war extrem gut recherchiert und man konnte sich voll und ganz auf die dortigen Informationen verlassen. Ein ganz grosses Kompliment!" "I explored parts of the NT and Kimberley last year, and your guides were absolutely invaluable. Thanks to you, we got off the beaten track, scared ourselves silly a few times (in a good way! ), and had a wildly good time. Many thanks for helping the uninitiated feel at home in a strange land." "We found it amusing to see so many people with your book under their arm as we travelled last year"
"I owe you a big thank you. Last year myself and two girlfriends took on the Gibb with your amazing full guide and had the best holiday ever!!! None of us had done much 4x4ing and your positive attitude gave us the confidence we needed. I am lucky enough to be going back to the Gibb this year with my boyfriend. I just saw you are heading home to have some surgery. I will be thinking of you and I guess there is no point writing "are you Birgit?" in the dirt on the back of my truck like we did last time?" "We downloaded your Destination Kimberley last year and did the trip towards the end of the dry season. We found it invaluable, information spot on, no exaggerations, no underestimates, it was our Bible. Thank you." "Thanks for providing such a valuable resource – we couldn't have done it without you." "We had your guide, the “Birgit bible” as we called it, printed and bound but by the end it had fallen apart from over use." "I would like to thank you for all of your assistance in organising this trip. Without your great book the job would have been much more difficult. I had a printout of your book in the car with me and when we had to change routes several times it made the planning for the change so much easier. All the info I required was there including where to camp etc. I can and will recommend this book to anyone planning a trip to the Kimberleys anytime in the future." Thanks again for your brilliant ebook which took all the stress out of planning a wonderful holiday. It would be crazy to go there without your incredibly valuable information." "Hi B, my husband and I have just returned from our 4 week journey from Darwin to Broome in a hired 4WD Camper. Thanks to your wonderful guide we had a very enjoyable, informed and safe trip. What an amazing country we have! I think the highlight of our trip was the 7 days we spent at Cape Leveque and Middle Lagoon. We (as you suggested in your guide) booked the beach shelters in both and could not believe how lucky we were to have such magic camping spots!! Middle Lagoon we nearly had to ourselves, being the only ones camping on the beach. I could go on for ages with everything we saw and did but you have heard it all before. So just wanted to thank you again for your guide and I have passed your site address onto friends thinking of doing the same trip. Thanks again B and good luck with your future ventures and website." Suggestion: why don't you extend your guides to NT and Pilbara?" Pilbara I don't know well enough myself, but if you know someone who does and who can imagine writing a book about it, send them my way! "Hi Birgit, Just wanted to give you a huge thanks for all your hard work in the guide. My husband and I have returned after a short fortnight travelling from Darwin to Broome. Your guide is absolutely essential and the only guide necessary (along with HEMA map!). We were virgin 4X4 drivers but we didn't come across anything too tricky apart from getting off the beach at Middle Lagoon after a particularly blowy night in one of their beach shelters. My best memories are the 6 am walk to the Mitchell Falls to escape the 'crowds' and the sun, the reef walk at Gumbanun, the obligatory helicopter over the Bungles, Staircase to the Moon in Broome. We crammed a lot into 14 days. We could never have done so much without your invaluable guidance. A top top guide book!" Well done, Birgit. Thanks again." "As a family of 5 it was a trip of lifetime and we could go back up there tomorrow and do it all again. The Dampier Peninsula was one of many highlights of our trip and is a must to see and do. We could of not seen and done as much as we did without the comprehensive Kimberley Travel Guide by Birgit. Thanks again B." Note from Birgit: The next poster in the Lonely Planet discussion questions whether the guide has info about several lesser known destinations. Of course it has! I would not even call these lesser known. They are pretty mainstream these days. You can expect info that is much more insider than that! And here are many, many more! 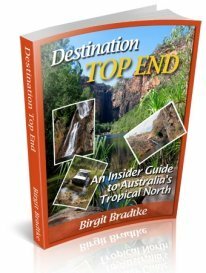 "First and foremost, thank you very much for the two very informative books, Destination Kimberley and Destination Top End. We have used them diligently in recent years. We have visited Australia for many years, usually 2-3 months per year. We are especially fond of the Kimberley and Gibb River Road. We simply cannot get enough of the many beautiful gorges, as well as the landscape at all. We can see, as you have also noticed in your newsletters, that the Gibb River Road is becoming increasingly commercial, but yet there is a lot of nature to explore. Last year we were in Cape York, another great destination. Later the same year through the Gibb to Michell Falls, for the first, but definitely not the last time. We followed your description to Cape Leveque and camped at Middle Lagoon. This year we are planning to spend most of the time at Destination Top End and in particular Kakadu park, we look forward to following your descriptions." I love "Destination Kimberley" and the other two in the series and wish other areas in Oz had similar books. "Just back from a magic 12 weeks in the Kimberley. Your guide on the Gibb was priceless and although reasonably crowded it was just as we hoped for. Finished off the Gibb with a 14 day cruise on Discovery One out of Derby, the only way to see the Kimberley. Reasonably priced compared with the other cruises and 100% perfect. Thank for creating the hunger to see this amazing part of our big, big country." Lots of thanks for your guide! It's really the Kimberley bible!" "We visited the Kimberleys two years ago, and I count your guide as a large reason why we had such a successful and disaster-free trip. We found the whole of WA to be fascinating, interesting and so different from the anodyne cities of the South East, and we were struck with the friendliness exhibited by almost everyone we met. I would certainly recommend your guide to anyone planning to visit your beautiful part of the world." "Keep up the great work, we did the trip absolutely hassle free and this was largely to the information and advice that you have provided." "Did the Kimberley trip with young kids and had fantastic time. We visited places we would never have had to courage to do on our own (Mitchell Falls being one). "The book is awesome as is the pocket guide. We commend you for your efforts. We head to the Gibb in two weeks and are very excited. What we will save in park costs will have paid for your book alone. Thank you for that advice." "Thanks Birgitta, I couldn’t do without the guide." "We have found your guide to Kimberley so helpful. Bless you for providing it all." "Vielen Dank und ich kann bisher die Begeisterung in den Rezensionen nur teilen - ich hatte bereits große Freude zu schmökern! 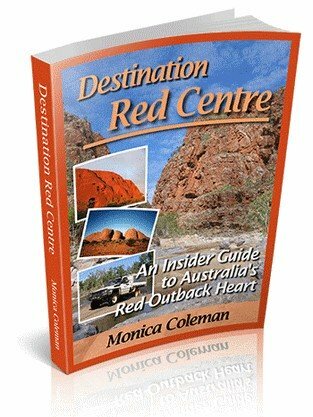 "Thanks for the updates, they are very informative, and your Destination Red Centre guide and Destination Kimberly are a must read for budding first time travellers like us." "We used your guides on the road trip to Darwin for every step of the way. Thanks for the great experiences!! I have recommended your guide to many people I have met along the way!" "You and your "Kimberley bible" (as my family call it!) are simply amazing! We successfully planned a trip with my parents and my partner from about 12 months ago and executed it this year in early June. Without your book, we would have had no idea!!!" Just a quick one to say thanks for the guide that we purchased, we used it extensively and referred the guide to others so hopefully you have had a few more travellers purchase the guide. Once again - thanks - the trip was so much more enjoyable." "After travelling around the Kimberley five times now, my wife and I would like to thank you for the information and warnings you provided. We found every information you provided to be of great value and luckily we have never encountered any problems whatsoever. The Bungle Bungles and many other areas are getting very crowed now, ie. even prior to the peak season. The first time we visited the Bungle Bungles in May 2004 both camping grounds had plenty of vacant spots and there was no booking required. Bells Gorge had very nice camping sites near the Gorge, these days no longer available. Soon we will see traffic lights on the Gibb River road??? Anyway, we have travelled the world and find the Kimberley still one of the most natural and beautiful places in the world. Thanks again for all your efforts." "We spent 12 days in the Kimberleys, I know, that's not much but that's the best we could afford right now! Still, we had an amazing time over there! During this time, we used a lot all the piece of advice in your guide, it was so helpful to us, so thank you so much for having written such a wonderful guide!" " We travelled through the Kimberleys last September and had a MARVELLOUS time, having your info at our fingertips. Thanks a lot and continue your excellent work!" "Your guides are fantastic. We have found them really helpful in setting our itinerary and can't wait to get on the road. " "I bought the book 9/2/16 finding it extremely helpful. We did the trip 2 yrs ago and feel much better prepared this time." "We used Destination Kimberly every day on our travels in the Kimberly and found it to be very accurate. We have recommended it to a number of people. We are now preparing to travel to the Top End and have found the Destination Top End to be just as useful and practical. Thank you for sharing your knowledge of each area. " "Your guides have been a bargain source of information. Your contacts and the information in your guides are almost essential for travellers through these areas. They were great for my Kimberley and Kakadu travels in 2014. Providing updates is a fantastic extra service. I am about to make a return visit through the Kimberley for an extended time so I will certainly appreciate your Guide update." "We have recently completed a two month trip of the top of the Northern Territory and the Kimberley. Your guides were invaluable and came to be referred to as the book which we used religiously. We found that for us they were accurate and informative. We did come across a change and that was in Gregory west NP on the Broadarrow Track the Escarpment camp site has been moved further down the track and now does not have the view mentioned in the book. Thank you for THE BOOKS"
"Visited the Kimberley last year your guide was our "bible". Thank you so much for your great passion"
"Used your guides on a trip last May/June up the Tanami to the Bungles and on to Broome. Gibb River Rd, Darwin, Lawn Hill down to Birdsville down the track to Mildura and home via Kerang and Gunbower where I grew up. Your guides were fantastic. My Daughter and I planned the Top End stuff completely on your guides. Thank you." "We wanted to say a heartfelt THANK YOU for your wonderful guide and that we sincerely wish you well with your health issues. Your guides were our invaluable companions on several Kimberley expeditions and you feel like a friend to us. We completely understand that you must take a break but wanted you to know how much your work has been valued and appreciated. " "Your guide contributed to make our trip to the Kimberley absolutely fantastic! My brother and I traveled there in July 2014. Not only did it give us a great overall understanding of the region and its different dynamics but I also remember it was full of practical tips that made a real difference many times. Just wanted to say thanks :)"
"We spent most of 2014 travelling around OZ, including many weeks on the Gibb in July. Our Ford Ranger and 19 foot off road caravan had no troubles what so ever. (Apart from dust ingress.) We loved it and found your guide to be most informative and helpful. Thank You. we are currently trying to work out how we can find the time to spend a couple of months in the Kimberley just after the wet. Coming from Adelaide, the thought of seeing all that water is almost unbelievable. There was a lot of talk at Imintji about plans to bituminise the road within a couple of years. We hope it never happens. Anyway, thanks again." "I just wanted to let you know how helpful your books were on our recent trip to the Kimberley's and Top End. It was our bible, thank you for all your efforts to produce such an up to date and realistic guide to a challenging area to travel. We towed our camper up to Mitchell Plateau at a cautious 40 km/ hour. We woke at 5am to hike in to the falls and beat the crowds and helicopters. The only way to do it. With cautious speeds and the right tyre pressures, we did not get one flat tyre the whole trip. People we met who came to grief all admitted they were travelling too fast. We'd do it all again tomorrow if we could." "We wanted to tell you just how valuable were both your guides for us. In August/September we drove from Darwin to Broome via Katherine, Kununurra, Purnululu, Fitzroy Crossing, Derby, Kooljaman, etc. We followed your advice all the way, and had a fabulous trip as a result. Thank you so much!" "We are back from our trip and a big thank you. Absolutely excellent book - we followed it to the letter - hung off your every word. It was great to have a guide book written by some one on the same “wave length”." "I want to let you know that your guides and newsletters were pivotal in making my 8 week Gibb River Road trip, in the Kimberley, a wonderful and memorable journey with my family. Thankyou"
"When we did the Gibb River Road we relied heavily on your literature and notes. Pity about Imintjie but I'm sure it will be a short lived closure. We thoroughly enjoyed our journey which included the Bungle Bungles and your input certainly made it an easier and less daunting experience - not like the lady in the Visitor Centre in Broome who told us we needed to take 120 litres of water!! (which we ignored)"
"I love your Kimberley Guide and have read often over the years since I joined your site. If only all places of interest had someone like you to help with their intimidate knowledge of such areas. Again thank you." "Wir sind eben von 4 Wochen Kimberley/Top End zurück und Ihre beiden Reiseführer waren immer dabei und haben gute Dienste geleistet. Viele Grüße ins wirklich schöne Kununurra!" "Just returned from 3 weeks camper-trailer convoy Broome/Broome clockwise. Your books were brilliantly useful! Thanks for your fantastic service - will highly recommend!" "Two years ago, we spent 5 months travelling down the WA coast. At that time I used your free guide for reference on our trip into the Bungles. We just got back from Broome and the Gibb River Road (we wanted to do it before they paved the whole length). For this trip I purchased your full guide and it was very useful. Thanks for a great travel guide, as it made planning the trip very easy." "Just wanted to tell you how good your Kimberley guide is. Excellent. We have just had 5 weeks in the tent, going up the Gibb River Road. We are still on the road, when we where in the Kimberleys, we used your book all the time, it was very informative and helpful. Thankyou for a very informative guide." "What a fantastic resource your Guide is - thank you so much!" "I wish to thank you for your guide which was AMAZINGLY helpful on our trip to the Kimberley in September. We had 2 weeks from Kununurra to Fitzroy Crossing self drive and it was the best adventure ever." "We just finished 3 months in the Kimberley and want to thank you for your fantastic guide. We could not have done without it." "My wife and I just wanted to thank you for your contribution to our tremendous honeymoon in Kimberley in late August 2010! We hired a campervan in Darwin and hit the Gibb all the way through to Broome. Your guide proved so useful, it really helped us make the most of this awesome trip (we only had one "bad" surprise: couldn't make it to El Questro, one of the creek crossings was too tough for our "basic" 4WD van). All in all, we had a fantastic trip, and a lot to talk about to our friends and family back in France. Thanks a million!" "The information in your guide was great and up to date when we did our trip through the Gibb River Road to Broome. The information helped us guide and select our destinations as to the weather and conditions of the roads and tracks. Many thanks to you. " "I think you are doing an AWESOME job. We've done our 1st trip to the Kimberley and absolutely loved it. Your Kimberley and Top End guides travelled with us and were very helpful. Thankyou." "Destination Kimberley is great. My husband and I are amazed by all the information you have provided." "We have just completed 7 month trip, your Kimberley Guide, we couldn't live without it. Did Gibb River Road following your advice NO hassles, so thank you." "We used your guide to get us through the Gibb River Rd, Dampier Peninsula and the Tanami and it was fantastic. So was the trip! Only thing was we didn't have enough time but that's life... Keep up the good work!" "We found your site and the Kimberley Guide very useful and informative. Your guide, and the HEMA Kimberley map, were our two most used items, both before and during our trip. We planned our trip around other people's itineraries published on your site and we constantly referred to your guide when making decisions about what to do during the trip. Every time I got to a creek crossing I got out your guide to check whether I could walk it without getting eaten! Thanks for putting together your guide." "Quick note to thank you for the Guide. We used it as our bible for the two months we were up your way and found it very useful. Thank you particularly for the RAAF Boab Quarry site - we had it all to ourselves (apart from two nice bulls and a not so nice king brown snake!) and camped at the head of the 'lake'. We are looking forward to getting back into God's country again soon." Hi Birgit, I want to thank you for your incredible book you have produced. We have just returned from our trip and we used your great book DAILY. We would continually refer to it for all the places we intended to go and for history information. Thank you for the incredible amount of work you have put into this. We appreciated it immensely. We will be recommending your book to any other travellers we know who will venture your way. Thanks again, Dianne"
Below are some more testimonials referring specifically to the two NT guide books Destination Top End and Destination Red Centre. Many of the over hundred testimonials above already mentioned both or even all three. I love Destination Kimberley and the other two in the series and wish other areas in Oz had similar books. "We are currently travelling in the Centre and finding your book, Destination Red Centre, to be exceptionally helpful. It was useful as a planning tool, but has been really good as a travelling companion. It's like having you with us in the van helping us find good places, or nominating the distances from place to place or advising when to air up or down, etc. We have just done a modified version of Route 6. We went down from Alice to see the Painted Desert and then over to Dalhousie, Mt Dare, Old Andado, Santa Theresa and back to Alice. Good to know what we should look for in Santa Theresa, so we persevered until we found the art centre you mentioned and then really enjoyed their art. We will pick up Chambers Pillar on a separate trip soon, and are planning camping and more walking in the East and West MacDonnells. So you will be with us for a while now. Just wanted to say thanks for doing such a useful guide and to let you know that we are getting a lot out of it." Providing updates is a fantastic extra service." "The information you provide is by far the best and most comprehensive out there. I'll never forget the day my family had at hidden rock hole in Kakadu all to ourselves while there was about 1 million people in the park. Thank You." "I got a copy of your Top End e-book some years ago and read it in preparation for a possible Top End trip. My wife and I did that trip this April and had a great time - the things that helped me from your book were the recommendations to consider going another time than July and to take our time in Kakadu. We were in Kakadu 3 nights and on 4 different days and enjoyed the time spent. It was not crowded in April, we enjoyed having a good amount of water, we managed everything with a small 2 wheel drive hire car. We enjoyed a late afternoon cruise on Yellow Water, a morning cruise on the East Alligator River, exploring Ubirr, and playing in waterfalls and pools at Litchfield. The weather seemed to go from late wet season to dry season in the 10 days we were in the Top End." "My boyfriend and I are coming close to completing a return trip from Melbourne to Darwin in a troopy and wanted to let you know it was made spectacular thanks to your guide. The secret spots along the way that helped us escape the constant flow of tourists made our time all the more peaceful (and romantic!) than could've been. We loved getting to know you through the guide and lived off a philosophy of WWBD (what would B do). Will be highly recommending - neigh demanding - that anyone else doing this trip takes your wisdom and insights to really see the heart of the Top End. Thanks for all your hard work and looking forward to reading your insights on the Kimberley when the time comes!" "Love the guides books. Moline Rockhole in Kakadu is a little gem I would've never discovered if it hadn't been for your books. Same as Umbrawarra. "We used your information when we toured Alice Springs, Kings Canyon and Uluru. Most helpful advice we could have had." "I just want to say that, thanks to your guide, we spent 9 amazing days in the Top End over Easter. The weather was awesome but many roads/tracks were still closed due to the heavy rains of the last wet season. However, there was enough to see and do for our entire trip and we discovered a few 'hidden secrets" we would have never been to without your guide. I hope I will have the chance to go again one day later during the dry to go to the places that were not accessible this time. Last year, your website helped me organise our trip in the Red Centre and was also very useful. So thank you for all that." "Having spent 2010 road testing your Top End guide as far as Katherine - I can't wait to test the Kimberley guide! I have really appreciated how you have managed to get me away from the coach trip infested parts of the Territory!" "My wife and me travelled in Australia for 4 weeks in July/August last year. We probably would never have done that (especially Tanami and GRR) without your web site and your guides. We went Alice ->Uluru ->Kings Canyon ->Mereenie Loop ->Alice ->Rabbit Flat ->Wolf Crater ->Bungles ->Broome ->GRR ->Lake Argyle ->Katherine ->Gunlom ->Jim Jim/Twin Falls ->Yellow River ->Litchfield ->Darwin. It was an incredible experience, we liked it very much. In fact, you were almost in our trip and usually we were asking : "What did Birgit say about that place?" "Hey Birgit, where can we walk for 1 or 2 hours from here?" "My mate and I just finished a month long tour from Darwin to Broome via Kakadu, Katherine, and the Kimberly. Your guide was a godsend. Can't tell you how many times we consulted "Birgit" to see what "she had to say". We found it all very informative and amazingly accurate. Thank you for saving us on those many nights where we wold have wandered forever trying to find camp or a good place for a drink! It was exciting and engaging for us both. It just wouldn't have been the same with out you. Can't wait for the Red Centre!" "I just wanted to say your guide is fantastic - I used to live in Alice Springs and you do the place justice; it made me long for it. I also work in the tourism industry for the NT so just wanted to give you a thumbs on providing an accurate portrayal of what there is to see and do. Keep it up B!" Here is the trip report Eva ended up writing. "Dear Birgit, I am sending a picture that you can share if you like, but mainly for you. It is your guides at the end of our trip. They are dirty with reddish dust, with all the notes I had made to find things faster, bent, definitely VERY USED. Thank you once more for all the the details and reliability of the info given." "Just have to let you know that we are just home after doing Kakadu and the Kimberley in just over two weeks and your two books went with us EVERYWHERE - from the Old Jim Jim Road to Broome, we carried the relevant parts under our arms even when we went walking! We have to tell you they were absolutely marvellous! Up to date and accurate, they added so much to our trip and enabled us to see very specific things we wanted to and not waste any time as we had so little of it. We have been singing your praises to others who want to do the trip!" "I have been meaning to email you to congratulate you on your brilliant publications - we have the Destination Top End and the Kimberley Guide and have found it to be invaluable in our planning. We are flying into Perth on 4 August this year, taking an internal flight up to Darwin and driving thru to Broome along the Gibb River Road. We arrive in Broome on the 20 August for a relaxing 9 nights before flying back down to Perth and then home to England on the 31st. "Thank you very much Birgit. We're well prepared with your marvellous guides. Really appreciate your style and the easy and interesting read." "I've purchased your two great guides (NT Top End and Kimberley) and will reference them constantly when we spend the month of May in the area. We pick up a 4WD in Darwin and hope to get to Cape Leveque and return by the end of the month. Thanks for your expertise and invitational manner." "I have already visited Australia 5 times and now I plan to come with my wife and six years old son, we are going to spend about three month in Kimberley and Top End. I've purchased your guide Destination Kimberley and also your new guide concerning Kakadu, Litchfield and Nitmiluk. I find them simply excellent and hardly beatable by any other guides. Thank you very much." "B, You have done it again. Your latest guide Destination Top End is fantastic! Maps, little known places, directions, points of interest and common sense advice all written in plain language. It is a must for anyone travelling from Darwin to Kakadu and beyond. Judy and I have already packed it for our trip in July 2010. Thanks!"